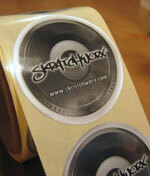 I'm just messing around a little with new ideas for skratchworx v2. Refresh your browsers and you should see a shoutbox on the left at the bottom. Have a play and let me know what you think. If it proves successful, it'll stay. Any problems with it, post below. Where are they all popping up from? ProfessorBX has uncovered another digital scratch controller - this time from ALCATech - in the shape of DigiScratch. Roonie G presents "Futuristic Digital Skratch Tricks For Your Grandma"
A package arrived for me last week from Pioneer CDJ evangelist Roonie G - a DVD with the gobful of a title - "Futuristic Digital Skratch Tricks For Your Grandma". 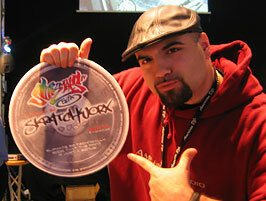 In the wake of MusikMesse, I'm pleased to announce the first ever skratchworx competition. Up for grabs is some of (actually most of) the booty we got thrust into our hands. Plus some we didn't. 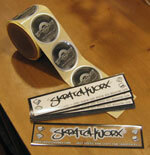 It's gotta start somewhere, so here's the first official skratchworx� stickers for your viewing pleasure. FinalScratch without the Scratchamp? Check DjDecks! Well it's a reality with DjDecks mp3 mixing software. Big thanks to Tobe ( ) for the info! Just so the guys at E-Scratch don't feel left out with all this digital madness happening in Frankfurt, time for an update on progress. DJ Flipside is readying up volume 4 of his Breakers Yard series. Finally, the final story from Frankfurt - Rane showing Serato Scratch Live. Local DJ's Sound control aka Superjam and Doc Tone plus Jesta were doing the honours. Continuing the digital manipulation theme, MixVibes have brought out a new version of their software - called MixVibes DVS (Digital Vinyl System). Despite all the clashing dance beats coming from various stands, DJ Skilz on the American Audio stand was cutting up like a demon. Check the short scratch set to see the man in action. 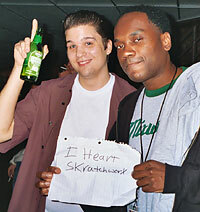 2004 looks to be the year where Final Scratch starts to get some competition. We saw 2 new digital controllers - Ultimate Scratch is a hardware controller that doesn't require a laptop. The new Tascam TTM1 CD controller was causing quite a stir in Frankfurt and quite rightly so. Check out the short clip and more pics. Ecler may have been resting on their laurels a little having one of the finest scratch mixers out there with the HAK 360, but MusikMesse saw the launch of the Nuo5. 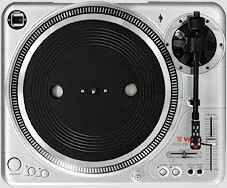 It might appear to be a club mixer but has many features scratch dj's will like. 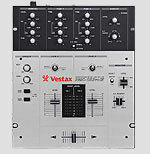 We spent some time with the Vestax guys, discussing QFO, the new sampling 05ProSL and other plans for the future. We've also got a demo movie of the new 05ProSL to show you what the deal is. MusikMesse - Numark CDX...now with added MP3! Obviously, our main interest was the CDX. 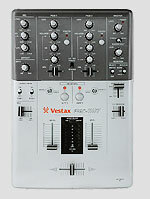 Aside from the pair the on-stand DJ had, 2 individual units were also on display, sadly without mixer. We were lucky enough to speak to the Product Development Manager and were treated to a full demo which of course we captured on video. New Final Scratch product announced - and an update on the rumoured new deck. As expected, the SL-DZ was on display and available to play with. And we did for some time. Also the new SL-MZ1200 in it's 2 colour ways. Plus the new limited edition 30 year gold 1210. [b]UPDATED:[b] Now with added DVJ-X1 demo movie. Ok people - let's get this started. Rather than one big report, I'm gonna break it down into sections, either by manufacturer or product. Makes it way easier to write and for you guys to read and comment. And easier on your browser as well.